I have had the opportunity to take the studio space next door to mine and Ive knocked the wall down!!! Its all happened quite quickly, so if you're in shock, don't worry, so am I! 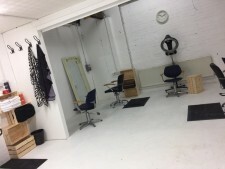 I wanted to expand the studio space to create a creative co working space for like minded stylist. Im going to invite 2 stylist to join me,!! They will be self employed and will run their own business, just as i do. Now that the studio is much bigger, there is plenty of space for everyone. Im really looking forward to the future, Im excited to have the opportunity to have a few other professionals around, to create a creative vibe together. Ive put a few pictures of the new space in the photo gallery, go on...... have a look.